Published: January 17, 2019 09:39 Pratyush Sarup, Special to tabloid! The bedroom and the bathroom are the most intimate spaces in the home. These spaces can be equally dramatic and calming. Before you make drastic changes to these rooms, consider these trends through the lens of your lifestyle and taste. Luckily, this year’s trends demand a heightened sense of serenity — you can’t really go too off the mark. Before discussing what is in, how about we draw a line under what will simply not work in 2019. Clutter, is definitely out. Whether you are a hoarder or a shabby-chic lover and no matter how artfully your excess is displayed, 2019 is the year you welcome new energy. So do as Netflix sensation and declutter guru Marie Kondo recommends — thank the stuff you no longer really need, and let it go. Rid yourself of posters and neon signs that shout life affirming mantras. If these are any bigger than a postcard they need to go. If you have floor to floor carpeting, or worse, cheap laminate flooring, rip it out. Add an area rug instead. Replace blues with warmer tones like greens, whites and yellows. If you have any fake plants, throw them out. Let real plants bring life into your home. In life and in your interiors, instead of perfection, aim for Wabi-Sabi. This Japanese concept and world view is based on appreciating the beauty and authenticity of nature’s impermanence, imperfection and incompletion. When it comes to interiors, this style is best described as a mix of Scandinavian and Japanese sensibilities. Think minimalist design with a rustic edge. To achieve this look, employ uneven finishes. This could be done as easily as buying an old furniture piece and scrapping the top layer of paint or varnish to explore the aged wood or buy a vintage leather chaise longue for a corner by the window. For a more dramatic effect, instead of wallpaper, clad the bedroom’s accent wall with a rough stone finish. As a result, tactile finishes, natural fabrics and a neutral palette are wise investments. This trend continues into one of the most important design elements of the bedroom — the headboard. Forget deep colours, velvet fabrics and dramatic styles. Clean lines upholstered in light fabrics will instantly lift the mood of the bedroom. 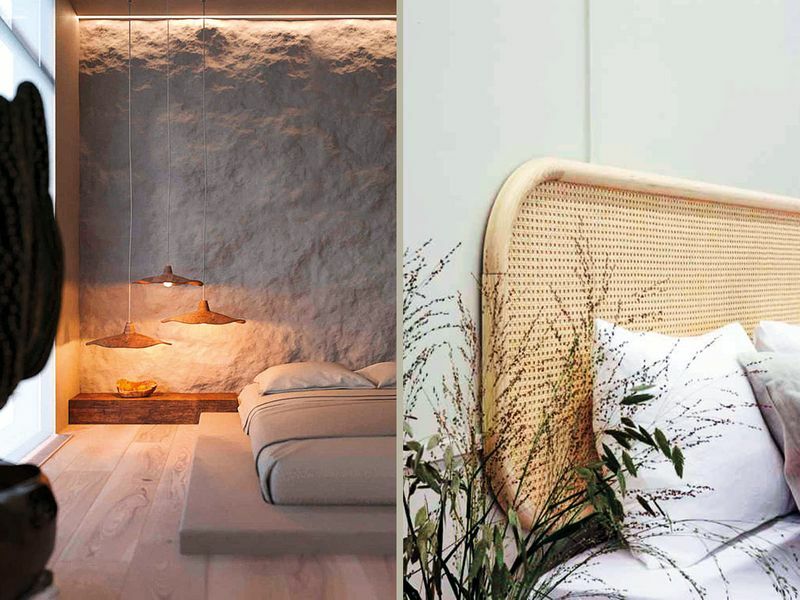 Cane and rattan bedheads are a huge trend in hospitality design. Rendered in light finishes and directly fitted onto the wall with brass tacks, they fit in perfectly with the year’s trend for bedrooms. Instead of mass produced, factory made beds, handmade furniture and accessories will be a lifelong investment that will stand the test of time. Ceramic vases and pots and antique picture frames in brass will bring nature into your bedroom. All you need, then, is a statement plant. 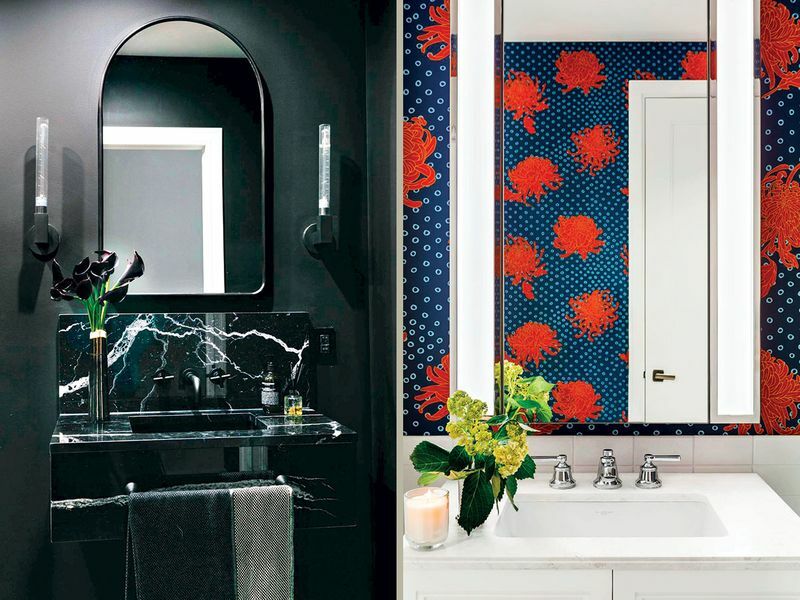 Whilst the overall trends for the bedroom speak in unison, the bathroom reveals a few contradictions — and they are indeed, stark. Unlike the bedroom that wants to remain devoid of gimmicks, the bathroom is where the drama plays out. Elements such as natural stones with heavy striations are still in, albeit applied in a diamond-esque book matched pattern. The standalone bathtub still holds court, but unlike before, it is streamlined in ceramic. Exposed shower plumbing in pewter is also gaining momentum. Luckily, the big trends for the bathroom are mere surface ones. Black is in favour. Think black marble fittings, stained cabinetry and if that is too much effort, the easiest way to achieve this look is to paint the room black. Textured wallpaper in black is also a great option as long as it’s water-resistant. For such a dark scheme, lighting is important. If new light fittings — preferably in a metallic finish — are not a possibility, a dramatic or unusual mirror often does the trick. On the opposite spectrum of the all-thing-black trend is the colourful prints. Monochrome or technicolor, oversized florals or lush tropical — re-do the walls in wallpaper that is bold and colourful for a very on-trend Instagram moment.